Very nice. hmm, should seperate the difference of eHRPD and EV-DO. I'm in the middle of having all of the towers upgraded around me and right now they are upgrading the tower i connect to most of the time when I'm at home. I can't wait till they switch it to network vision . I think the app needs a tiny bit of work. Love it. I think the meter should be a speedometer. That' be awsome xD red all the way to the left, yellow middle fading to green. Nice!! I was looking to do something very much like this! 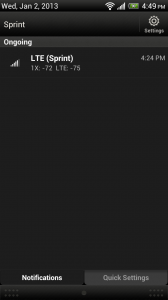 Any possible way to do what Sensorly did and get the LTE Cell Identity working on some phones? I've also been reverse engineering how some the ##DEBUG screens work on the Note2 as the 1X PN and other info would be VERY helpful as well. Lite version: Sent you a crash report: I get 4gLTE only intermittently on my stock JB 4.1.1 GS3, and when I do, the app consistently crashes. Seems OK when LTE is not present. Now if Samsung would only update to a release that allowed access to the Sector ID info . . .
And, thanks for this, it will be very useful. Agree with both on adding Cell ID for LTE. Nice App! I actually added LTE cell ID info to version 2.08, which I released late last night.. I suspect that is what is causing the crashes, since this is a brand new problem. 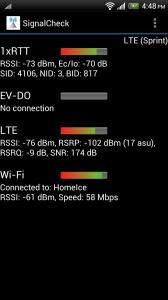 Any chance anyone with Jelly Bean got any cell ID info on LTE? Or anyone with Jelly Bean have it not crash while on LTE? I also saw some crash reports come in for some of the shortcuts on the Advanced menu. I'll check everything out this afternoon. The sector info is there but not by a normal api. You have to request it from the baseband then parse it out. -- "Sensorly or it didn't happen!" I am very curious what total set of info is accessible by this API or what additional info can be readily fished out the baseband, as digiblur notes above. I am not sure that a single third party app can ever replace the internal debug/engineering screen apps on some handsets. But those debug/engineering screens are being removed from many more recent devices on many carriers -- Sprint seems to be the holdout thus far, thankfully. Regardless, it would be quite nice to have a third party app that could provide at least as much detail as the debug/engineering screens. Then, the exclusion of debug/engineering screens in a handset (e.g. Nexus 4) would not be a deal breaker. I have much knowledge of CDMA service options, PN offsets, channel assignments, neighbor lists, carrier bandwidths, UARFCNs, etc. My full assistance is at your disposal. Just got the Pro version and will give it a shot. Not much LTE in the Raleigh/Durham area yet, but that's why this app will be nice to have so I can tell when I hit a 4G connection. Great job, will let you know if I find any issues. Crashes on my S3 when I go to Advanced.. Battery Info, and also Advanced.. Radio Info. I reported one of the crashes from my phone just in case it gives you any useful info. What are the "Field Trial" and "EPST" options? Field Trial says it's not available on my device and EPST is greyed out. Can't wait to test out when I get a chance to visit where some of the completed RDU towers are. That sounds easy . . . 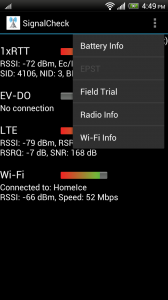 The LTE sector IDs are available in the Jellybean 4.1.1 API. But according to what the devs at Sensorly say, so far there are few devices that populate it. Then it sounds like it was blocked in the programming on many devices. I doubt that it is blocked, exactly. More likely many OEMs just failed to implement all the Jellybean API. I have read that implementation of the whole Android telephony API was imperfect in earlier versions, too. 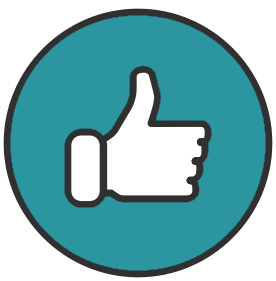 Did you add it to the lite version also. 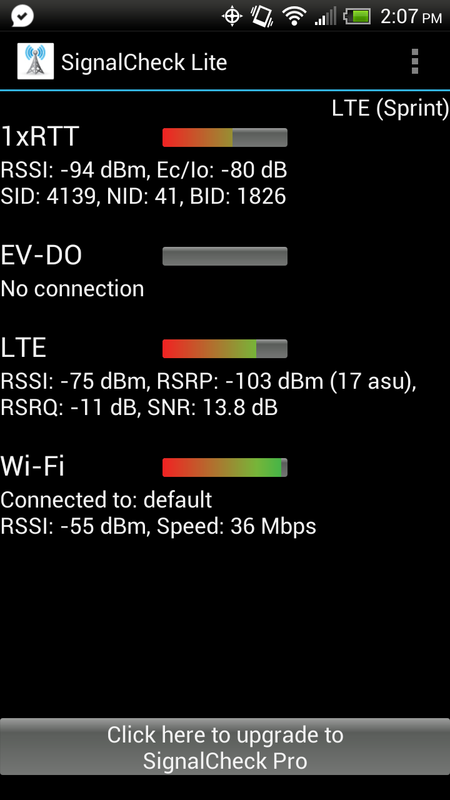 I am running 2.08L on and EVO LTE with 4.1.1 and do not see it. Run's great, no crashes. Couple of ideas. Configurable notification when going to 4g. Notification when going to 22xxx SID for 800smr. Widgets? Donated! Keep up the good work. Ec/Io is also missing a decimal point. Measurement lower limit is -31.5 dB. What an awesome app! This is exactly what i've been looking for! 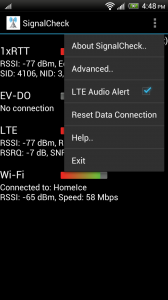 One suggestion, RSRP/RSRQ reading in the notification instead of RSSI, for LTE. This is a sweet start, and it's so clean. Does the API provide active and neighbor PN's for 1x and DO? If you can get them in there, I'd definitely get the full version. Worked the first time for me. Looked nice. Now crashes on my s3 every time. Even after a reboot. Works like a charm on my rooted S3 with a stock ROM. Great app!!! I just bought the pro verison. Thanks for the report. It appears that many Samsung devices either do not have these screens, or do not allow access to these areas by third-party applications. I have improved the error-checking routines in the latest version (2.09, should be available on Google Play within the hour) to handle this. Field Trial and EPST are diagnostic screens normally accessible by entering special dialer codes, at least on HTC devices. I intended to allow these shortcuts to save people the hassle of knowing the dialer codes, or possibly accessing these screens on devices without a dialer (such as a tablet). If the function is not supported by a device, there is not much I can do. This part of my app is meant to provide a shortcut to pre-existing screens, not create new functionality.